What the Bluzhever Rebbe went through during the Holocaust was mindboggling. The Nazis murdered his wife, his only daughter, his entire family, almost all of his hundreds of Chassidim. After the War, it took a lot of courage for survivors to remarry. But after his liberation from Bergen Belsen, somebody suggested a match to the Bluzhever Rebbe, a widow who had survived, amazingly enough, with her 4 children. And that woman, named Bronya, became the Bluzhever Rebbetzin. Years later, somebody asked the Rebbe how he knew, despite everything he had gone through, that he wanted to marry his Rebbetzin Bronya. At one point, when the Rebbe was in Bergen Belsen, he went to the camp officials to request permission to bake matzos. Most of the Jews, of course, didn’t put their names down on the request, because they figured writing their names was as good as writing their own obituaries. So the Rebbe and 4 other men wrote their names down on the request to make matzos. And they submitted it. So those 5 men, thinking those were their last moments on earth, said goodbye to their friends. But, instead of killing them, the camp officials informed them that their request had been approved. So then the question was, who would get to eat from the matzos? There were only a few small matzos and tens of thousands of Jews in Bergen Belsen. But she answered them, “My children are the next generation. They have to know what matzah is. They are the future of the Jewish people. So the Rebbe gave them matzah. So why did the Rebbe decide to marry that mother of 4 children after the War? The Rebbe later explained, “Nobody in Bergen Belsen thought about the next minute. You didn’t think about the next day, the next week. Survival was second to second. “And here is this woman who is thinking she’s going to survive? And that there’s going to be a next generation? 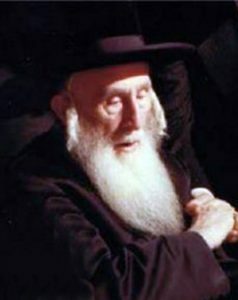 The Rebbe and his Rebbetzin, who lived until 99 and 94, didn’t have any more children after the war, but the Rebbe raised Rebbetzin Bronya’s 4 children as his own. And the Bluzhever Rebbes today are those children who ate matzah in Bergen Belsen, in the merit of their mother’s astonishing determination and faith. Every day until seder (9 days to go!) I will be posting a “Meaning-in-the-Cleaning Minute”: a minute-long video or short story that made ME smile as I get ready this year for Pesach. Thank you for posting this special story with your hallmark warmth and style. 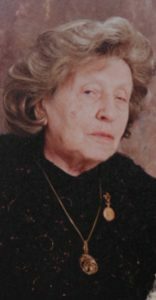 I just wanted to mention that there are a couple of errors – Rebbetzin Bronya had two children, not four, whom the Rebbe indeed raised as his own. They were both boys. The older on became Bluzhever Rebbe after the Rebbe passed away. That older son passed away several years ago, and his sons are the Rebbes now. So the Rebbes today are the children of one of those two children who received that precious matzah in Bergen Belsen. The story made me cry. Such strength, courage, and connection to Hashem. If only I could have a little piece of it, like the matza they broke off in the camp. thank you for sharing with us a story of so much courage. There are more stories about the Holocaust experiences of the Bluzhever Rebbe and Rebbitzen Bronya in “Chassidic Tales of the Holocaust” by Yaffa Eliach. 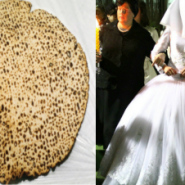 One of those stories is about how Bronya had some bread, and found a non-Jewish prisoner to whom she sold it before Pesach, the way we sell our chometz, with the intention of buying it back after Pesach. I believe that she asked the Bluzhever Rebbe to organize the sale according to halacha.